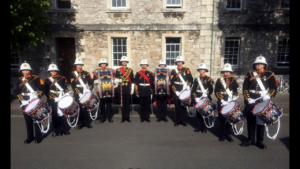 Music Training has been part of the Royal Marines Cadet syllabus since the early 1900s, and indeed we have previously had Royal Marines Cadets based alongside the Royal Marines School of Music. Our Band has previously appeared at the Royal Tournament and was on film during The Cockleshell Heroes movie. Portsmouth Section based at HMS Excellent, Whale Island in Portsmouth. Plymouth Section based at RM Stonehouse in Plymouth. The Band wear the traditional ceremonial Blue uniform as worn today by the Royal Marines Band Service, a privilege granted to very few outside of the Service. Our cadets can either be a drummer or musician, and can join from the ages of 9 to 16, and serve until aged 18. 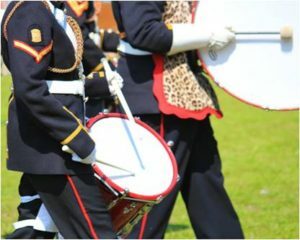 We accept diarect entrants to the Band for boys and girls whose musical skills are already well developed (subject to an audition) whilst those with little or no musical experience join the local RMVCC unit and can transfer once they have passed out from recruit training. We are also looking for more teaching and operational band staff so if you have musical experience and would like to inspire and instruct our young players please get in contact. 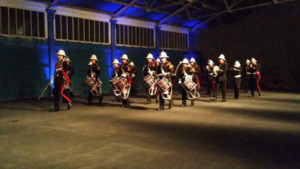 Our musical cadets have an illustrious past, with our bands having appeared at the Royal Tournament, Jersey’s ‘Battle of the Flowers’ carnival, the Ashbourne Highland Gathering and Portsmouth Navy Days. Our Band including its Corps of Drums is also available for public displays for which we may ask for a modest donation to cover costs. Appearing in public not only raises the profile of the Volunteer Cadet Corps but also helps develop cadets’ confidence and allows them to show off their well-earned skills.